- the fundamental difference between the 2005 scheme and the 2007 Eastern Bypass planning application. The gantries were not shown in the booklet for the public, nor in general sections, nor in before/after views. The landscape impact was misleadingly minimalised in the information which Conservative Wiltshire Council presented to the public. Proposed high ugly features were not as apparent as they would actually be. Conservative Wiltshire Council told us that its gantries would be of similar size to telegraph poles. The truth about Wiltshire Council's ugly secret gantries came out at the Planning Inquiry. This picture of a Wiltshire Council eastern bypass bat gantry was produced only in 2008. It was not in Wiltshire Council's public 'consultation' on its bypass planning application in 2007.
a metre. So total height of these large ugly gantries was to have been about 7m above the road. The 7m high gantries were to be on embankments, themselves in places over 5m above ground. These gantries were to be about 18m wide between the uprights and up to 29m across overhangs. These gantries were designed for two super-sized high lorries to be able to pass through simultaneously. The idea is that bats fly above, whereas dormice cross the road on ropes strung between. Is it credible? WC said that such ideas would 'put nature first'. Wiltshire Wildlife Trust said that it was 'a leap of faith'. Gantries on embankments were to be at Bratton Road (on a 6m embankment), at Beres Mere, Wellhead, three straddling Bitham Brook (all in sight of walks) and at the Westbury Ham end of Shallow Wagon Lane. Along the tops of the embankments was to be 2m high close-boarded fencing and a further 2m of mesh. All of this would have been visible from the White Horse and many places in Westbury and West Wiltshire. The County Landscape Officer said that the eastern bypass would have been highly intrusive, sufficient to spoil the enjoyment of those people using the local footpaths, bridleways and open access land. WC's eastern bypass would have meant four roundabouts, two railway bridges, three watercourse bridges, two secondary road bridges, a bridleway bridge, three underpasses, seven ugly bat gantries, fourteen lengths of high boarded bat screening, five wildlife tunnels, plus artificial lighting for various places along the route. When the bat gantry design was installed elsewhere, it was found to be completely useless for its purpose. 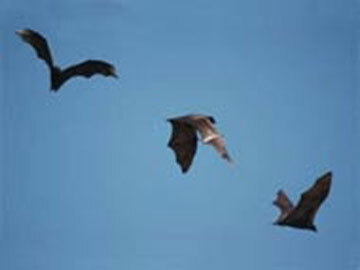 Here is a Conservative Wiltshire Council picture, promoting WC's bonkers Eastern Bypass project, of the bats for which the monstrous gantries were intended, which happened to be Giant Fruit Bats from the Far East...!